In May, Singapore will confuse all those that describe the nation-state as a concrete jungle, and showcase more than 90 keen sustainable farmers and producers from across the island. This May, the Suntec Singapore Convention and Exhibition Centre will resonate to the sound of greens being weighed, energy-efficient tricks being swapped and healthy food being eaten. 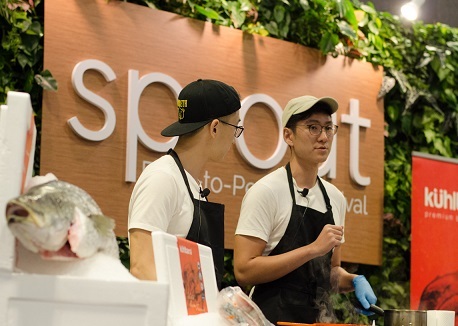 On 11-12 May 2019, from 10am to 8pm, Singapore’s largest farmers’ market – SPROUT– kicks off for hundreds of urban farmers, foodies and home cooks to discover the best and latest in sustainable produce from across Singpaore. technologists, specialty and artisanal food, as well as homegrown food and drink venues. There will also be inclusive activities including tea-making and gardening workshops, and Michelin-star chef tutors at the ‘Sprout & Learn’ cooking masterclasses. SPROUT will celebrate good, sustainable food - Arun Madhok, Suntec CEO. Courtesy Suntec. refreshing kombucha from the likes of The Rare Honey Company, Pétale Tea, and Yocha Kombucha. Add to these delights artisanal chocolates made using Asian-grown and harvested cacao, vegan cheeses, essential oils, aromatherapy materials, and organic skincare products too. Cooking demos will also feature at SPROUT. Courtesy Suntec. And as well as the Masterchefs offering tips on cooking, a number of urban farming setups such as Aerospring Gardens, Carbon InQ, Green Spade, and Vegepod will be on site to pass on help, information and produce insiders’ tips for keen green gardeners to get started into urban farming and gardening. “Sprout is Singapore’s largest Farm-to-People Festival, and it’s about bringing growers, food producers and the community together to celebrate local and sustainable agriculture, urban farming, and good honest food,”say the organisers. And being held at Suntec, with excellent bus and train connectivity as well as plenty of bike paths for access, you can visit without adding to global warming too. Make a date in your planner. For more details and updates, visit www.visitsprout.sg.